One of the new things built into the Windows XP taskbar is the grouping feature. When the taskbar fills up with buttons, Windows XP consolidates icons from the same program into a single button, as shown in Figure 3. To access one of these grouped windows, you click the button and then click the window you want. Figure 3. When the taskbar gets filled with buttons, Windows XP groups similar windows into a single button, as shown here with Windows Explorer and Internet Explorer. You can close all of a group’s windows at once by right-clicking the group button and then clicking Close Group. The grouping feature makes it easier to read the name of each taskbar button, but the price is a slight efficiency drop because it takes two clicks to activate a window instead of one. If you don’t like this tradeoff, you can disable the grouping feature by right-clicking the taskbar, clicking Properties, and then deactivating the Group Similar Taskbar Buttons check box. Another way to prevent grouping is to give the taskbar more room to display buttons. The easiest way to do that is to resize the taskbar by dragging its top edge up until the taskbar expands. If this doesn’t work, the taskbar is probably locked. Unlock it by right-clicking the taskbar and then clicking Lock the Taskbar. 0 When the grouping kicks in (that is, when the taskbar gets full), Windows XP will group the buttons from only the applications that you have used the least. 1 When the grouping kicks in, Windows XP will group the buttons from only the application that has the most windows open. If a second application surpasses the number of open windows in the first application, the second application’s windows will be grouped as well. x Windows XP will group any application that has at least x windows open, where x is a number between 2 and 99. Note that the grouping occurs even if the taskbar is not full. Note that you must log off or restart Windows XP to put the new setting into effect. Note, too, that you can also change this setting via Tweak UI. Display the Taskbar, Grouping item. The group policies offer unprecedented control over the Windows XP interface without having to modify the Registry directly. This is particularly true of the Start menu and taskbar, which boast more than 40 policies that do everything from removing Start menu links such as Run and Help to hiding the taskbar’s notification area. To see these policies, launch the Group Policy editor and select User Configuration, Administrative Templates, Start Menu and Taskbar. Remove Drag-and-Drop Context Menus on the Start Menu Enable this policy to prevent the current user from rearranging the Start menu using drag-and-drop techniques. Prevent Changes to Taskbar and Start Menu Settings Enable this policy to prevent the current user from accessing the Taskbar and Start Menu Properties dialog box. Remove Access to the Context Menus for the Taskbar Enable this policy to prevent the current user from seeing the taskbar’s shortcut (also called context) menus by right-clicking the taskbar. Do Not Keep History of Recently Opened Documents Enable this policy to prevent Windows XP from tracking the current user’s recently opened documents. Clear History of Recently Opened Documents on Exit Enable this policy to remove all documents from the current user’s recent documents list whenever Windows XP exits. Remove Balloon Tips on Start Menu Items Enable this policy to prevent the current user from seeing the balloon tips that Windows XP displays when it prompts you about new hardware being detected, downloading automatic updates, and so on. Remove User Name from Start Menu Enable this policy to prevent the current user’s name from appearing at the top of the Start menu. This is a good idea if you need more room on the Start menu for the pinned or frequent program lists. Hide the Notification Area Enable this policy to prevent the current user from seeing the taskbar’s notification area. Do Not Display Custom Toolbars in the Taskbar Enable this policy to prevent the current user from adding custom toolbars to the taskbar. How images appear on your monitor and how efficiently you use the monitor’s viewable area is a function of two measurements: the color quality and the screen resolution. The color quality is a measure of the number of colors available to display images on the screen. Color quality is usually expressed in either bits or total colors. For example, a 4-bit display can handle up to 16 colors (because 2 to the power of 4 equals 16). The most common values are 16-bit (65,536 colors), 24-bit (16,777,216 colors), and 32-bit (16,777,216 colors). The screen resolution is a measure of the density of the pixels used to display the screen image. The pixels are arranged in a row-and-column format, so the resolution is expressed as rows by columns, where rows is the number of pixel rows and columns is the number of pixel columns. For example, an 800 by 600 resolution means screen images are displayed using 800 rows of pixels and 600 columns of pixels. How does all this affect productivity?  In general, the greater the number of colors, the sharper your screen image will appear. Sharper images, especially text, are easier to read and put less strain on the eyes. If you read a lot of onscreen text, particularly if you use a notebook or an LCD screen, activate Windows XP’s ClearType feature, which drastically reduces the jagged edges of screen fonts and makes text super-sharp and far easier to read than regular screen text. To activate this feature, launch Control Panel’s Display icon, select the Appearance tab, and click Effects. In the Effects dialog box, make sure that the Use the Following Method to Smooth Edges of Screen Fonts check box is activated and then select ClearType from the list below it. Click OK and then click OK in the Display Properties dialog box to put the new setting into effect. Note, too, that you can customize some ClearType settings using the ClearType Tuner PowerToy, available from Microsoft’s PowerToys for Windows XP site (www.microsoft.com/windowsxp/downloads/powertoys/xppowertoys.mspx). At higher resolutions, individual screen items—such as icons and dialog boxes—appear smaller because these items tend to have a fixed height and width, expressed in pixels. For example, a dialog box that’s 400 pixels wide will appear half as wide as the screen at 800 by 600. However, it will appear to be only one quarter of the screen width at 1,600 by 1,024 (a common resolution for very larger monitors). This means that at higher resolutions your maximized windows will appear larger, so you’ll get a larger work area. The key thing to bear in mind about all this is that there’s occasionally a tradeoff between color quality and resolution. That is, depending on how much video memory is installed on your graphics adapter, you might have to trade higher resolution for lower color quality, or vice versa. Open the Control Panel’s Display icon to get the Display Properties dialog box onscreen. Display the Settings tab, as shown in Figure 4. Figure 4. Use the Settings tab to set the screen resolution and color quality. 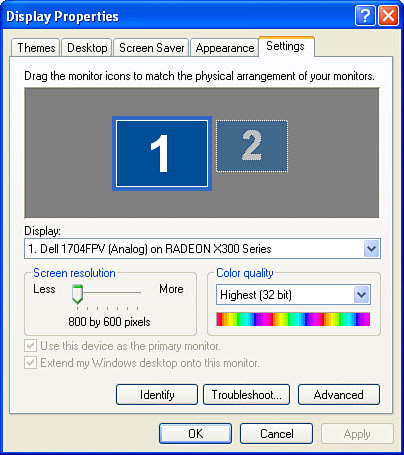 To set the resolution, drag the Screen Resolution slider left or right. To set the color quality, choose an item from the Color Quality list. Click OK. Windows XP performs the adjustment and then displays a dialog box asking if you want to keep the new setting. If your graphics adapter or monitor can’t handle the new resolution or color quality, you’ll end up with a garbled display. In this case, just wait for 15 seconds and Windows XP will restore the resolution to its original setting.